Harpers Ferry WV. Lewis and Clark? 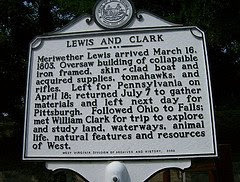 Lewis and Clark are more familar as key explorers of the American West, but here in Harpers Ferry West Virginia the Lewis and Clark expedition camped for some time while wagons and boats were made and provisions put up for their upcoming adventures. Fresh with orders from Thomas Jefferson to document and claim lands to the west of a fledgling USA, Lewis and Clark made their way to Astoria Oregon and home again in one of the most significant of all American expeditions. Yosemite National Park in California offers some of the most sublime and spectacular mountain scenery on earth. Yosemite was popularized by naturalist John Muir and later by photographer Ansel Adams, but the park needed no special advocates for its awesome splendor. The hike up half dome (on the opposite side of the dome not seen in this picture) is one of the best in all the National Parks but is not for the faint of heart. The end of that hike is so steep you must pull yourself up the side of half dome via cables that are secured into the rock, though the hike does not require any technical climbing ability thanks to the cables.